After Thanksgiving, while we were trying to figure out how to use up all that leftover Turkey, of course I turned to Pinterest for ideas. Because, why not? I go there for daily inspiration anyway, so I thought it would be a great starting point. After getting extremely sidetracked with all of the cute DIY Christmas idea, I turned to my trusty friend google. Somehow, the thought to make a risotto got into my head and I found one for a turkey and mushroom risotto made in the slow cooker. Perfect! 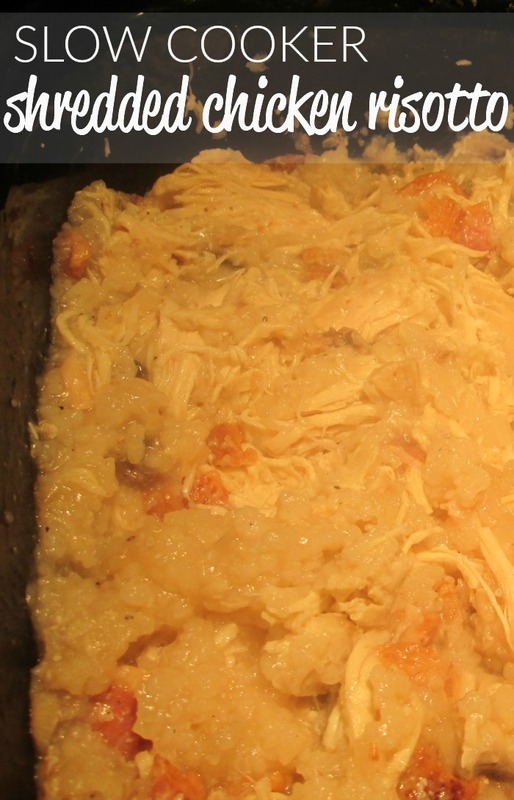 It came out wonderful and I thought why not try to duplicate that by making a slow cooker shredded chicken risotto. This recipe is also very budget friendly, with the priciest item being the arborio rice. We buy our chicken in bulk packages, using a few chicken breasts at a time, and freezing the rest for later use or making a few recipes in one day. The preparation was different because this time around, I was using raw poultry. Last time, the turkey was already cooked so it was a matter of either cooking the chicken before hand or letting it cook with everything else. Next time we make this, I think I’ll try cooking part of it together first (vegetables, bacon, and chicken) and then putting it in the slow cooker. First into the slow cooker? 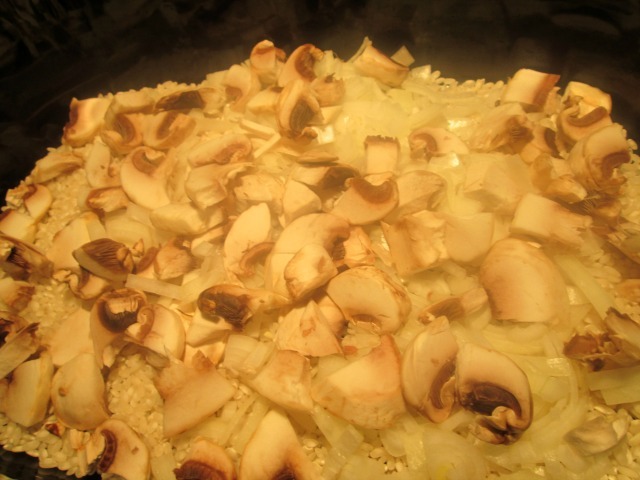 A layer of arborio rice, one onion, and mushrooms. Leftover bacon, a rare occurrence in our house. 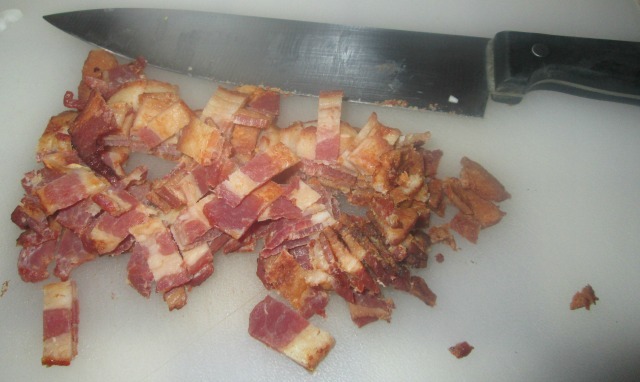 Or, you could also try pancetta. 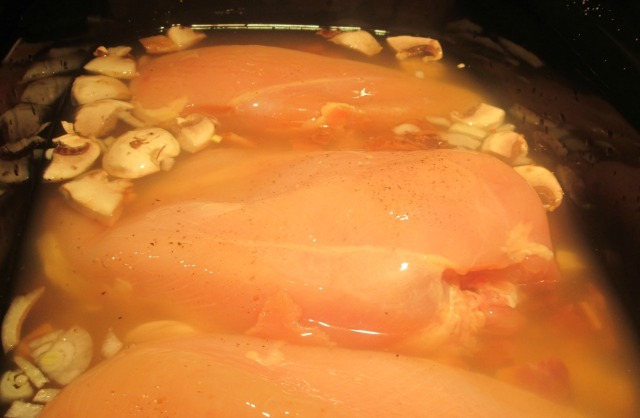 Three raw chicken breasts (boneless/skinless), chicken broth, and seasonings. Shred chicken just before serving, I ended up using two forks to make it easier but you could also just use the one fork. And the finished, delicious, product. While it wasn’t quite like the turkey risotto, this one was still delicious. I was curious to see how it would turn out and it definitely met my expectations. « Is Your Heater Making You Sick? You had me at bacon. 🙂 This recipe sounds really good and simple, accessible because it’s in the crockpot. Love it! Thanks so much for sharing this! It looks delicious, and I’m always on the lookout for great new slow cooker recipes. Very nice.. always looking for a good chicken recipe.. Bookmarking this for future! This recipe sounds amazing! I love anything I can make in my slow cooker! Yum this looks delicious I love using my. Slow cooker so this would be great! My kids would absolutely love this too! I looove risotto, but it takes so long to make! I tried making rissoto once. It didn’t turn out very well because I rushed adding the liquid and didn’t let it cook long enough. Nothing worse than crunchy risotto. But, in a slow cooker, I bet I wouldn’t have to worry about it since it’s already in there, cooking slowly and perfectly. Thanks for this post! Ohhh, this sounds divine. I love risotto so much, I even had Disney serve it at my wedding! I really want to try and make this because I always seem to be successful with my crockpot! That looks delicious. I can’t wait to give it a try. Thank you for sharing! Looks amazing!! 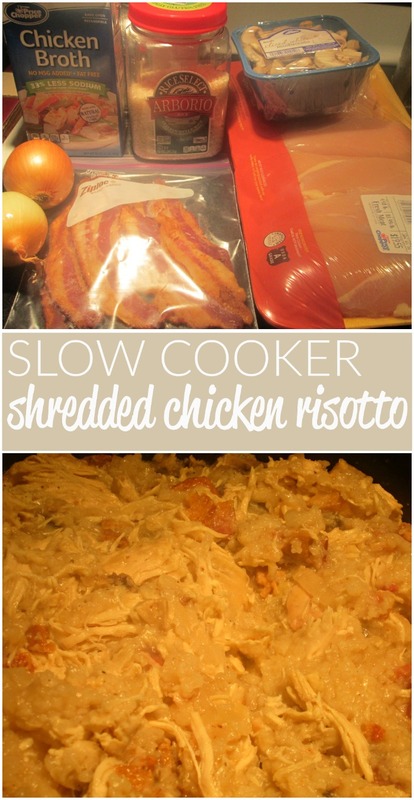 I love using my slow cooker to make dinner I never thought to do risotto that way! This looks absolutely delicious! The fact that it is a slow-cooker recipe makes it that much better! Thank you for sharing it! Oh y heck that looks fantastic! Not only does it look yummy but it is pretty healthy as well. I have never made risotto but this inspired me to try. I love nothing more than risotto, it is one of my favorite side dishes ever. This makes me want to try the recipe, because chicken is my favorite meat! You’ve done good! I’m always looking for new recipes for the slow cooker. Looks so good! I love slowcooker recipes. This looks really good and I love bacon. =) Will have to try this this weekend. 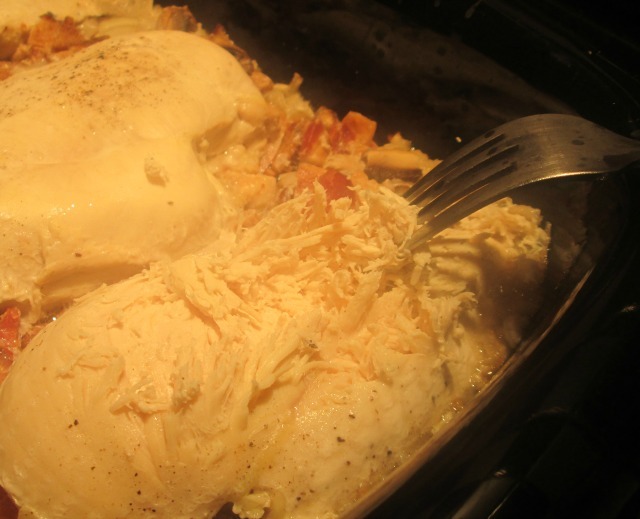 Nothing better than a nice chicken risotto, this looks insanely yummy! I love risotto with just about everything! Chicken, mushrooms, peas, carrots, zucchini!!! You name it! I love my slow cooker and I love risotto. I even have a box of the same brand in my pantry right now. I will be trying this one for sure! I have a quick question…your recipe lists: 1 1/2 32 oz boxes of Chicken broth…would that be 6 cups (48 oz)? yes. sorry about any confusion. I had to adjust the liquid as we were going. This looks so good and sounds pretty easy to make. I am a huge fan of shredded chicken. This sounds amazing and I am definitely going to give it a try. OMg this looks great! I never had risotto but you made it look delish! Now this sounds like something my whole family would enjoy. My husband can pick out the mushrooms. How delicious, I’d love that for a dinner option during the week. I have to invest in a slow cooker! I love using our slow cooker. And the fact that this recipe has rice, this is a must-try. Going to print it. Thanks!